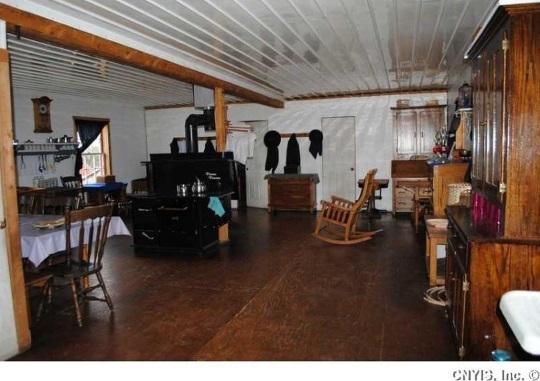 Want to see what a very plain Amish home looks like inside? 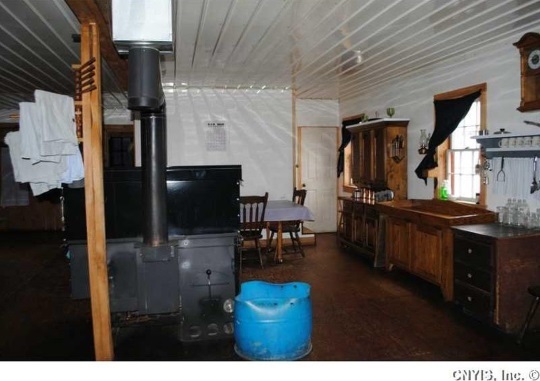 There are currently photos online at Zillow.com showing the exterior and interior of a Swartzentruber Amish home up for sale. The price on this home, located in the area of Pulaski, New York, is $94,900. 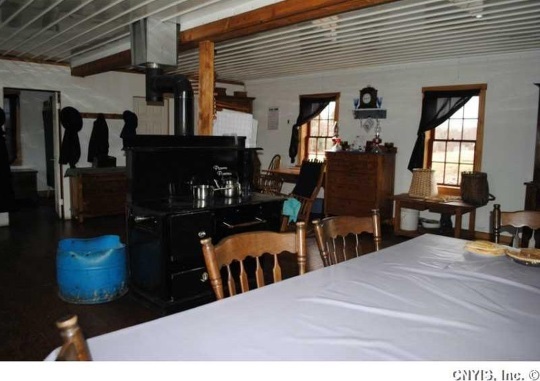 It’s listed as having 2 bedrooms, no bathrooms (Swartzentruber Amish do not use indoor plumbing), and having 1,512 square feet, on a little over 27 acres of land. 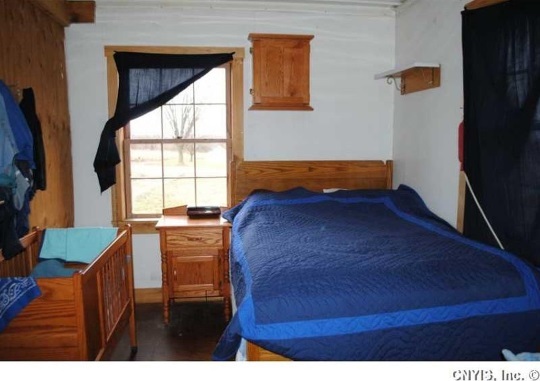 There are a total of 24 photos available at the Zillow listing for this property, which you can see here. The Swartzentruber Amish are arguably the most traditional of all Amish affiliations. You can see some things in these photos that indicate that. Since Amish properties tend to be purchased by other Amish people, it is always interesting to see when they are advertised online through traditional real estate portals–and even more so since this is a very plain Amish community. However it does happen that non-Amish people purchase and convert Amish homes for conventional use. We’ve previously seen similar advertising with a couple of other Amish properties – one in the Belle Center community in Ohio, and another also in New York state. Thanks to reader Erin for sharing this listing. About the only difference I see in these photos from the homes I am familiar with is the natural wood trim around the windows. The Swartzentrubers in Randolph, MS paint theirs. Even the towel drying rack on the post in the second photo is the same. However, the chairs are much fancier than I am used to seeing. There are a number of Amish built homes in the Randolph community that have been purchased and converted by English including one that was built by Amish, converted by English and then sold back to another Amish family. Not sure how they got rid of all the electrical and plumbing fixtures but knowing how these folks think, I am certain they did. It looks to be very nicely finished – it is obviously quite new. I’ve never before seen the metal or vinyl lining used here for interior finishing on ceiling and walls. My impression of Swartzentruber homes would be of untaped drywall, unfinished wood floors; generally looking quite shabby. But I guess i am stereotyping! Not the case at all ~ I have never seen a Swartzentruber home that wasn’t beautiful. If you notice in pictures of which I have many ~ they have no upholstered furniture and for large families you will generally see the table with benches and a smaller table with 2 chairs in the living area all the children sit on the floor or at the eating table. Their known by their blue color the doors and often the roofs. Osiah, I’ve been in many Swartzentruber homes that would match your impression. The metal siding indoors is a new one to me. I’m going to take a guess that this family is living in the shop and had in mind to put up a proper house at some point. We see that a lot with younger couples in many groups — move into the shop until a house can be built. Mark, I have only been an outside observer, but my observations agree with your thoughts that many families do seem to build and live in the vocational/secondary building (e.g., a shop or even a barn) first, then build a proper house. I don’t know about either the Swartzies or this area in particular, but in seems in several of the OOA settlements that the red buildings (such as the one pictured here) are vocational/secondary, and the house proper is white or some other community-agreed-upon color. Mark, the metal siding for the ceiling was the first thing I noticed! I wonder if the house was spruced up for sale. That might explain why it is fancier than you expected, Osiah. I did notice a pie on the table, a trick used by realtors to entice prospective buyers to conjure up homey thoughts. 😉 The barn looks to be in pretty good shape, too. I have heard that red for barns is forbidden in Allen County, Indiana. The Amish there seem to like red brick, though. Thanks for the post, Erik and Erin! Very nice to see these photos! Don, you are right. 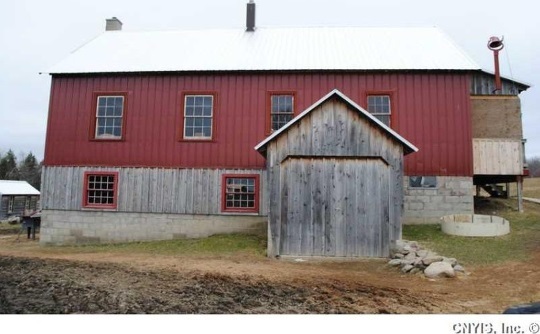 In many Amish communities the “residential” buildings are white and everything else is red, but that can vary. The recent post showing a Lawrence Co., PA, daughter settlement shows the all-white buildings that group favors. Then there are those like the Nebraska people who have white houses but do not paint the barns. In Holmes Co. many of the more conservative groups still have the white/ red color use, but in moderate or progressive groups that has changed and it’s not uncommon to see the barn color match the house. 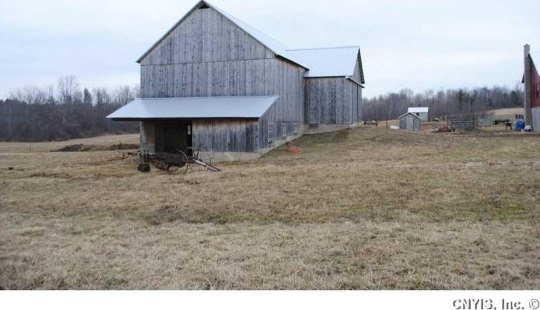 We see a lot more tan or gray barns than we did 20 years ago. Our house is white, but our other buildings are tan & brown. Sure, I know that the practice varies from place to place, and in my somewhat limited experience it is the more conservative groups that do the red vs. white/other color scheme, with the more progressive going pretty much away from it. But thanks for confirming it. Hi! I shared this. The Amish district in the western part of the town, where this is located, seem to use white wooden siding when they build new. The district in the eastern part of town do not have white houses (unless it is a converted English home) but use what looks like tar paper or some other sort of plain house wrap in a dark green for the houses and black for outbuildings like a root cellar. Both are Swartzentruber. high end in todays society.. They were very blessed to live there! 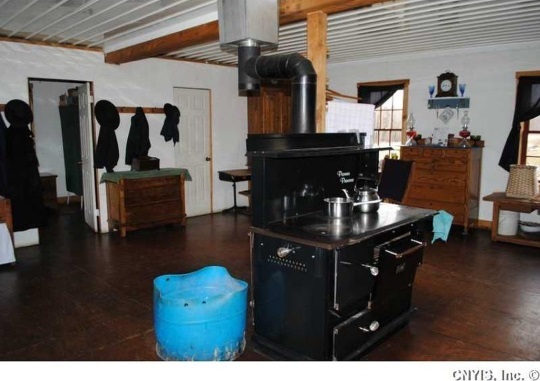 The wood cook stove looks like a Pioneer Princess. It does look like a Pioneer Princess. I went back & looked and then it hit me what the cut-off blue plastic barrel beside it might be — a bin for wood scraps or maybe even the wood box. It looks like it might have gotten a bit too warm a time or two. Judith, you just made me want to go back and look at those pictures in a whole new way. 🙂 I never even thought about the “dreamy side” of a home for sale! Judith, I appreciate your thoughts. I often think similar thoughts when visiting historical buildings or older local homes for sale. 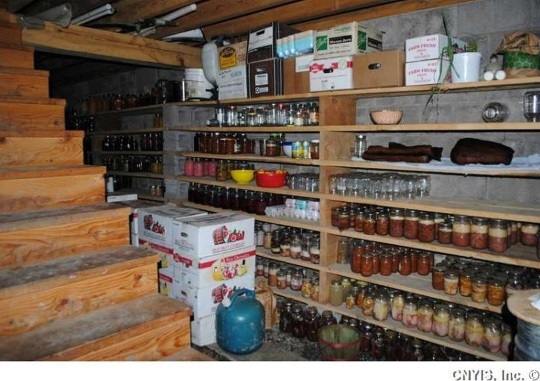 I can’t help but wonder why the house is being sold…it looks “homey” enough on the inside. Do they need more room for a growing family? I wondered about the blue plastic “thing” next to the cookstove, too. I thought it might hold water…what do I know?! I enjoyed looking at the pictures on this post, as well as the additional ones on the link. I have been in several Swartz. homes many times in the Orange Co., Indiana settlement and this one looks very similar. Yet, this one seems to be a little fancier, in the decorations on the wall, mantle, shelves, etc. I think a home like this shows much beauty in its simplicity. Is the $94,900 for all of those acres as well? It would be fun to have such a place, even if just to play farm. One wonders where the owners are headed. Does anyone have more details of the area to share? 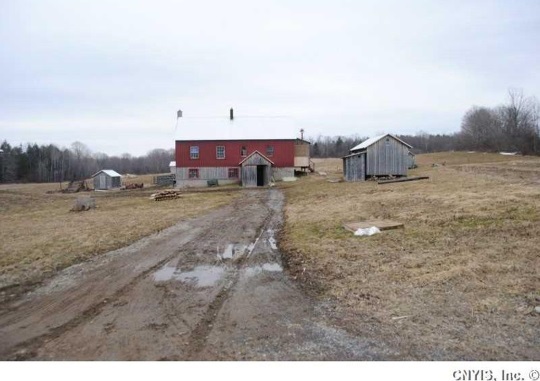 Many of the Ohio Amish are running out of land to farm and there are large settlements popping up in Upstate NY where there are many farms available and lots of fertile land for farming. I grew up about 45 minutes north of Pulaski. I didn’t know that Amish have settled there. Makes sense since so many Amish are looking for more areas with land to grow their communities. It was interesting to view the pictures. Quite similar to the Swartzentruber home I have visited in Holmes County just a bit “fancier”. The Amish homes I’ve been in (Michigan,) do not in any way, resemble this home! They are much plainer and not very homey or inviting. There is furniture against every wall and nothing in the middle. Since religious services are held at a different home every week, furniture is always placed out of the way. There is very little or no decoration of any kind on the walls. Everything in those Amish homes was for convenience. Cleanliness was not of the utmost concern! I do understand it is not easy being clean when you cannot use any modern conveniences. I was gratified that these families invited me into their homes because I bought some of their homemade wares whenever I was in the area. 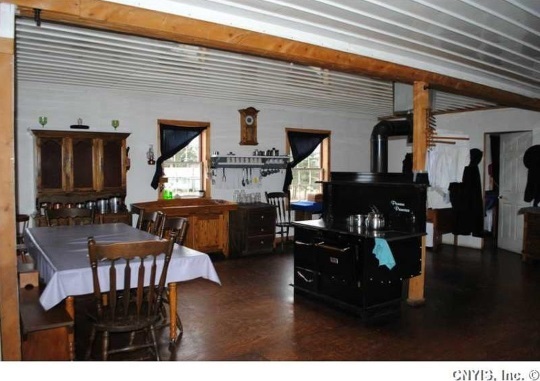 Their homes are VERY different than an old order Amish home they do not have upholstered furniture nor coaches only 2 to 3 wooden chairs in line bing area and benches at their table. Nothing on walls and except maybe in the teens rooms. They are a plainer more strict sect than old order. Do they have any Amish in the state of Mississippi? The Old Order Amish located in the Springford, Ontario / Norwich, Ontario region of southwestern Ontario are very conservative and this certainly reminds me of what you’d see from them. 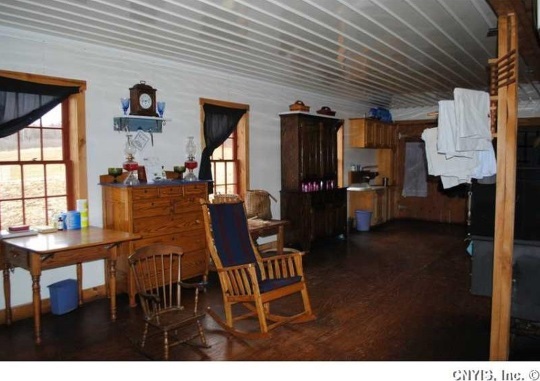 When you see inside the houses, basically they appear like these, for all intents and purposes mid 19th century, simple farmer homes with natural woods, lots of white, stained wood floors, etc. As others mentioned here, they too follow the usual dictates of white coloured houses and then red painted barns, sheds, etc. Whenever people talk about the strictness of the Swartzentruber Amish, it always sounds exactly like the Old Order Amish I grew up around. I should add, the floors may not be staine. Natural plain wood — no ornamentation like patterns or patterns formed by stains however. These were interesting to me, Shawn. We have friends in Norwich and it was nice to see pictures from that area and recognize some of the homes. I would be interested in seeing more. And thank you for being respectful about their feelings on photography. Many are not. You might be interested in knowing the Amish in that area are “Abe Troyer” people, a more progressive off-shoot from the Swartzentrubers. There are some strong similarities, but enough of a difference they can be identified as different. Well I grew up next to all of them. They were my neighbours and they knew us and we them. So only natural to want to be and plus it is why we knew their position on that. 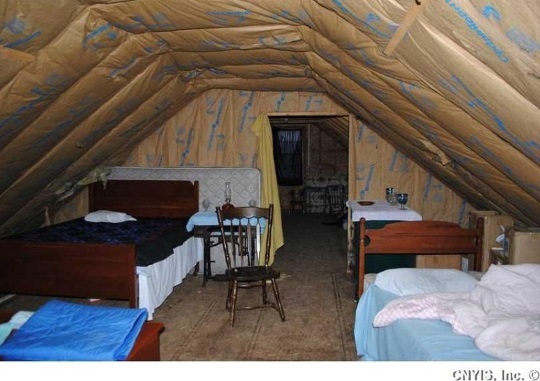 The thought of sleeping in an unfinished attic under the insulation makes me itchy!